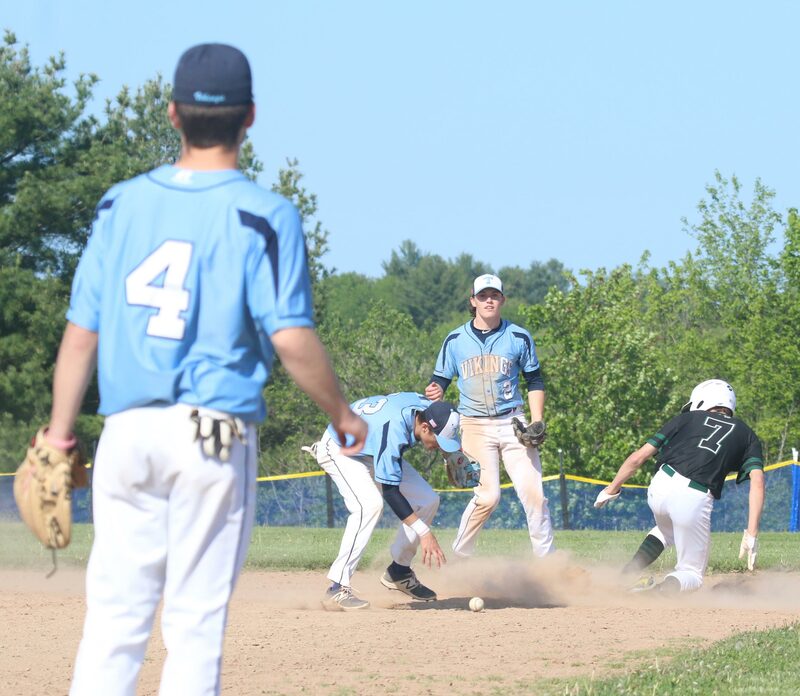 (Byfield MA) There were so many baserunners in this game that at least twice they had to delay the game while the bases themselves were repaired! Not really, although two of the bases needed help. 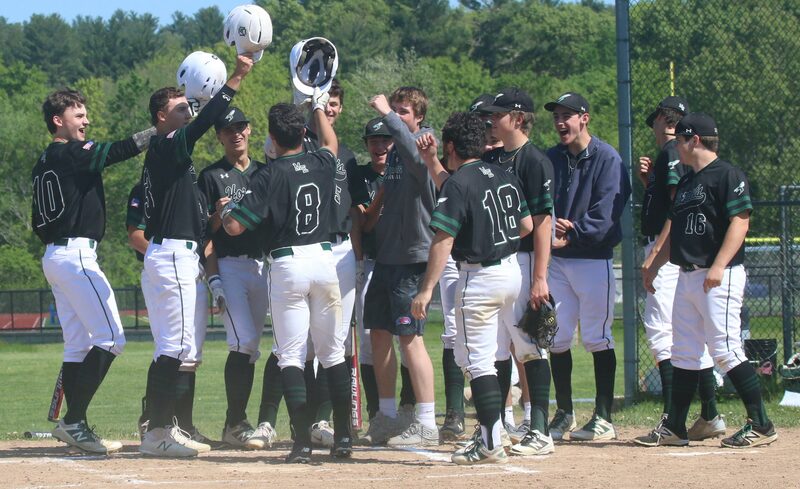 Triton rallied for two runs in their last at-bats to overtake Manchester-Essex, 12-11, on a sunny/breezy Thursday afternoon of Cape Ann League baseball. This game radically changed complexions three different times. “You talk about highs and lows,” said Triton coach Ryan McCarthy afterwards. The Vikings (11-6) were down 3-0 after three Hornets (12-6) had batted. 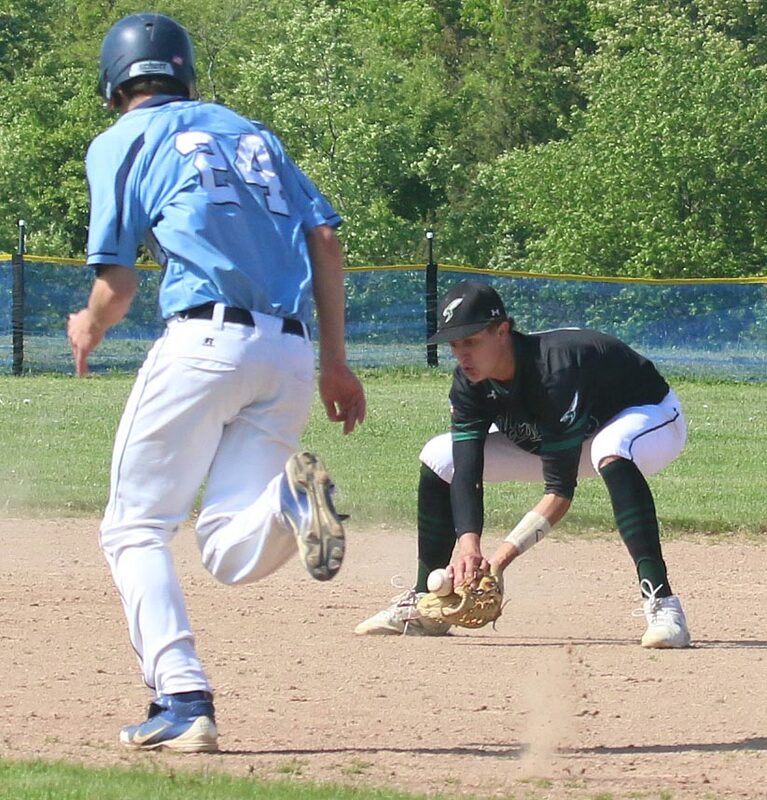 However, by the end of the fifth inning Triton led “comfortably” 9-3. The next three outs saw thirteen Hornets bat and unleash an 8-run inning that pushed them ahead 11-9 after six innings. 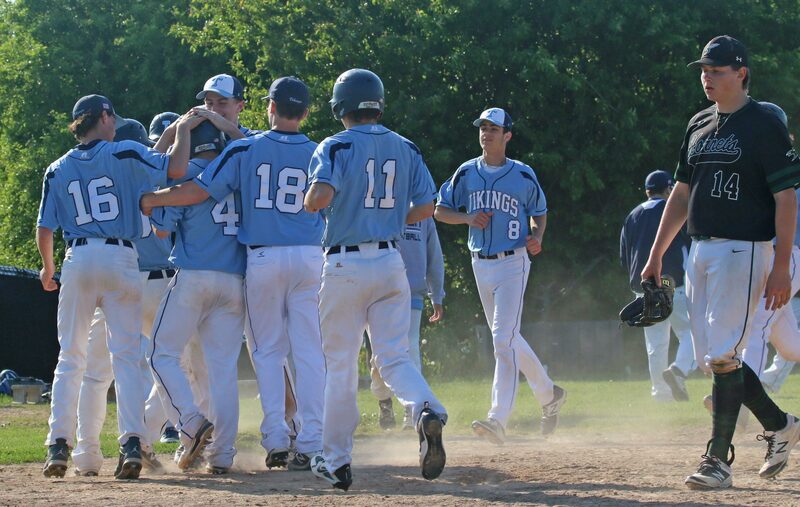 The Vikings got a run back in the bottom of the 6th to get within one and then grabbed the W in the final inning. 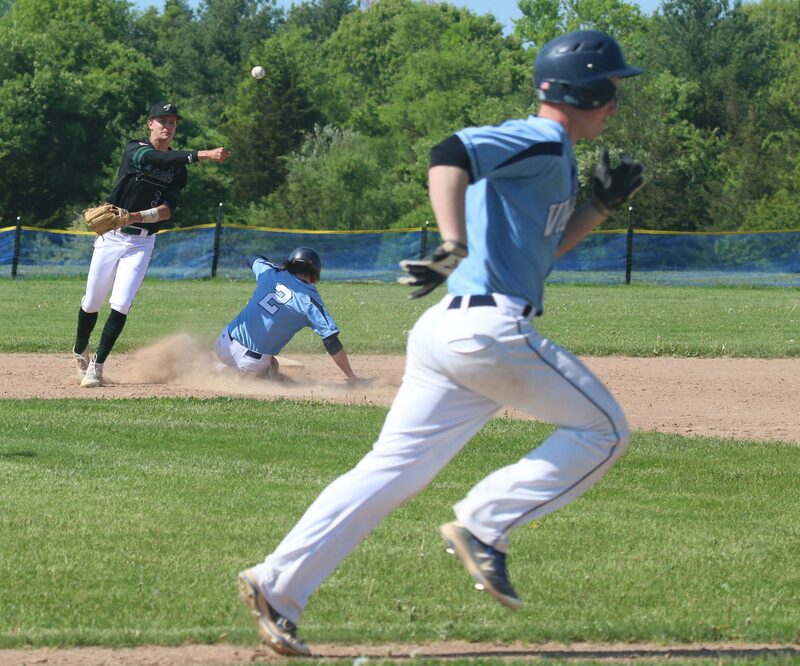 ME’s Mitch Paccone (2B) threw past second in the 3rd inning allowing two runs to score. In the final inning a bad throw to first set up, in scoring position, the tying run and the winning run. The Triton defense had its problems too. Errors by 1B Kyle Odoy and SS Tommy Lapham enabled the Hornets to get some extra at-bats during their eight-run sixth inning. Tommy did settle down allowing just three hits into the sixth inning. 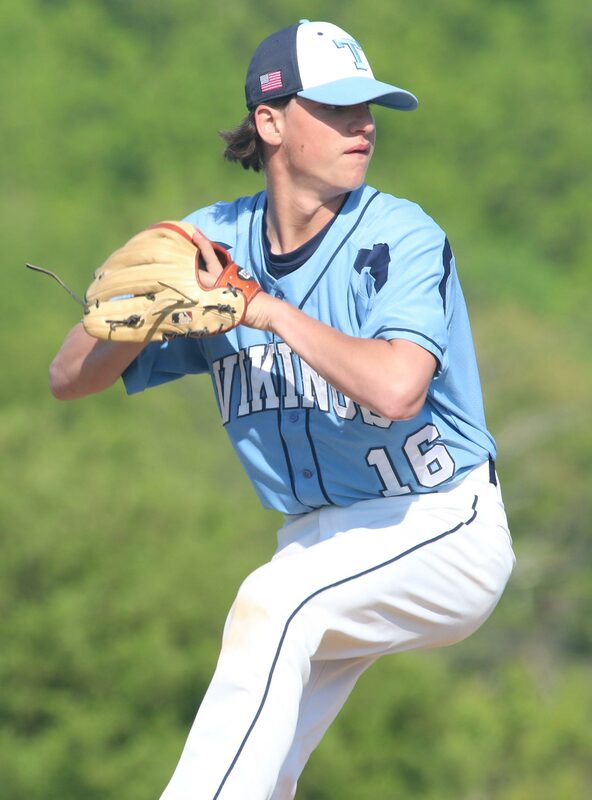 Meanwhile, after a scoreless first inning, the Vikings began to put on runners and put up runs. The Hornets used five different pitchers (Dylan Wilson, Will Janowicz, Casey Fackre, Gavin Glass, and Cosmo Pallazola) during the game. None of them pitched longer that two innings. 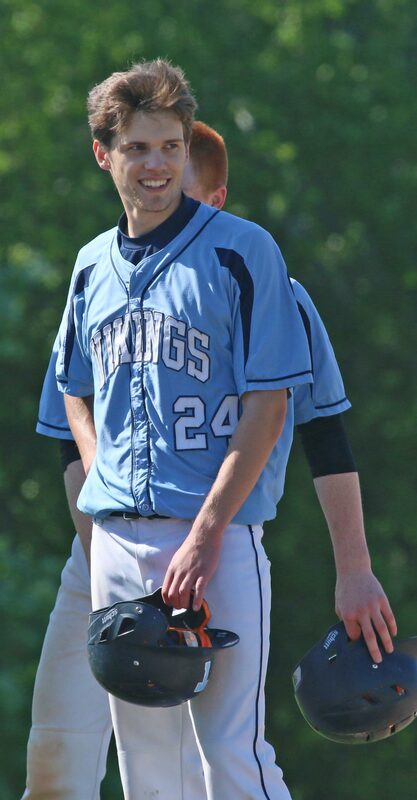 “We’ve got injuries and we’re trying to find out what we will have for pitching in the playoffs,” said Coach Weed. The ME pitching struggled during innings 2-5. In the second, two hit batsmen started a one-run inning. In the third, an error paved the way for four runs. 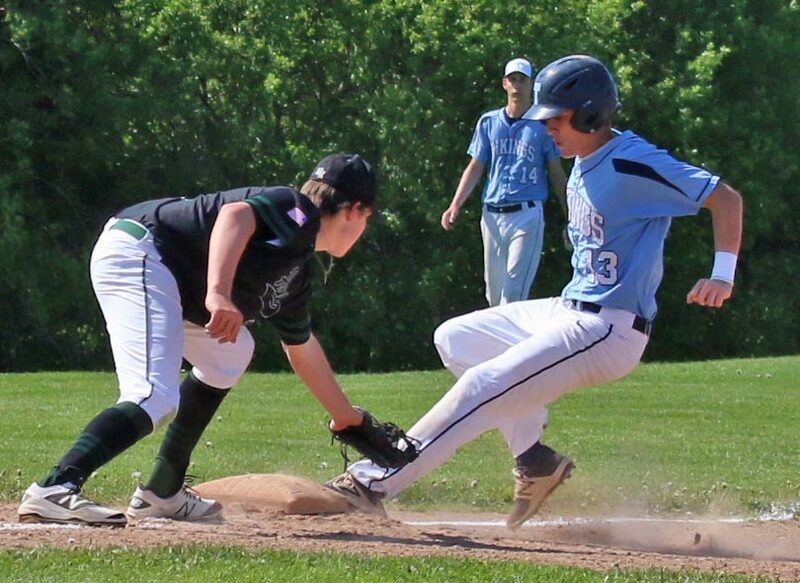 In the fourth, a wild pitch scored one of Triton’s two runs. 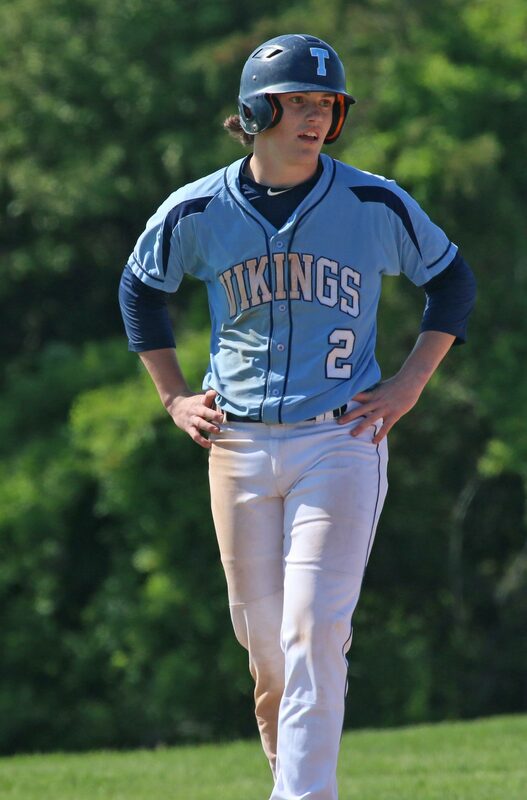 And then there was freshman Kyle Odoy’s homer in the Vikings’ two-run fifth inning. It looked all downhill for the visitors after five innings down 9-3. “Manchester-Essex stuck around, and fought, and then went up,” recalled Coach McCarthy. You wouldn’t have guessed that it would happen after watching five innings of this game. “We’re a really good hitting team so I knew that we weren’t entirely out of it when we were down 9-3,” said Coach Weed. And right he was. 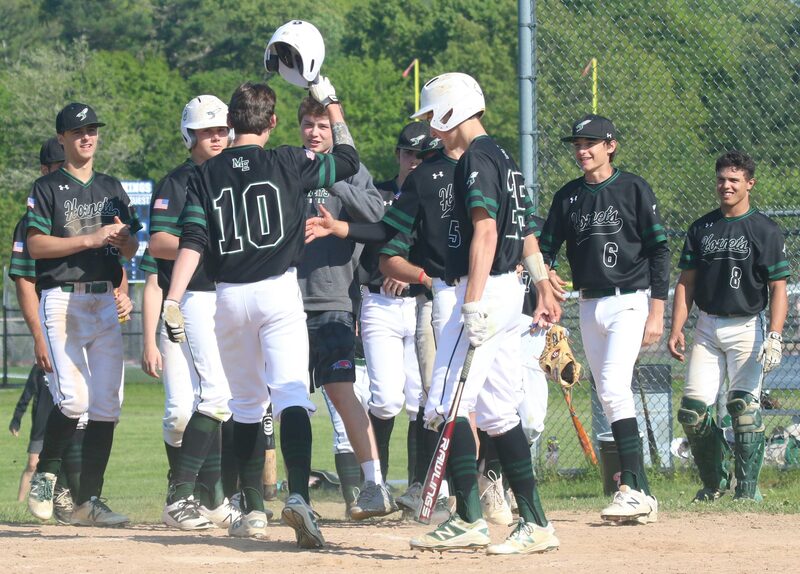 The Hornets started that productive sixth inning with a Bennett O’Leary homer. Then ME put three singles and a walk together for another run. Out went Tommy Lapham and in came Mark Glickman. Two errors, two hits, and another walk and the Hornets caught the lead. 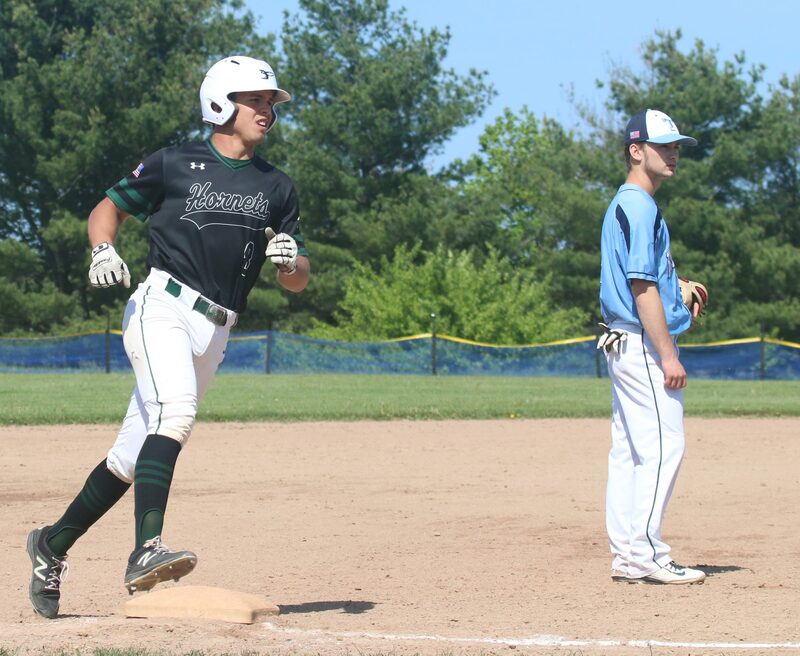 Cosmo Pallazola’s sacrifice fly padded the lead to two runs heading into the bottom of the sixth inning. More pitching problems developed for ME. Gavin Glass gave up a single to Tyler Godfrey. Max McKenzie was the pinchrunner. Max took second on one wild pitch and third on another. Ross Lojek’s fielder’s choice brought Max across to make this a one-run game. After a 1-2-3 top of the 7th, the Hornets brought on Cosmo Pallazola to attempt to hold onto that one-run lead. 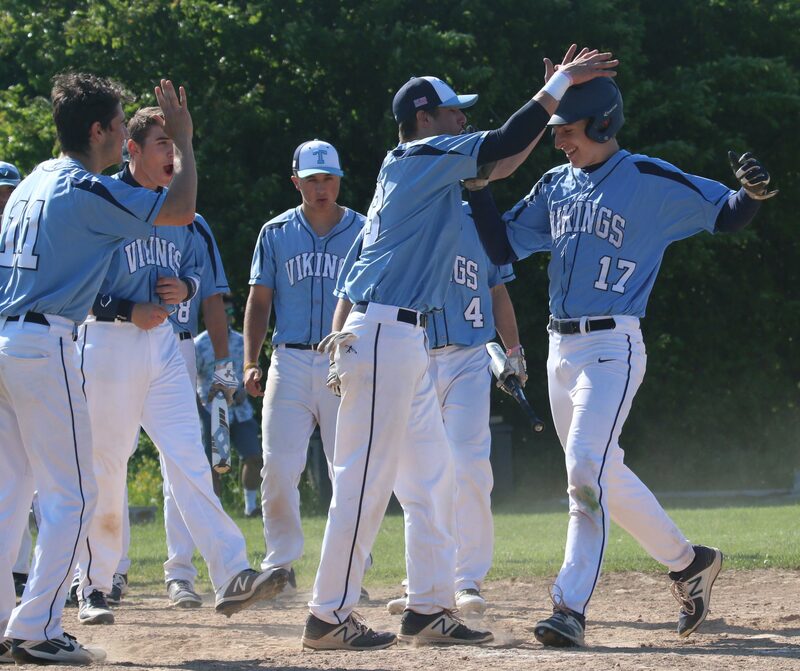 A single, an infield error, and a sacrifice fly (Cam Gilroy) tied the score. With Marc Wood (reached on the error) on second the Hornets intentionally walked Tommy Lapham. A wild pitch moved the runners to 2B and 3B. Another intentional walk loaded the bases with one out. 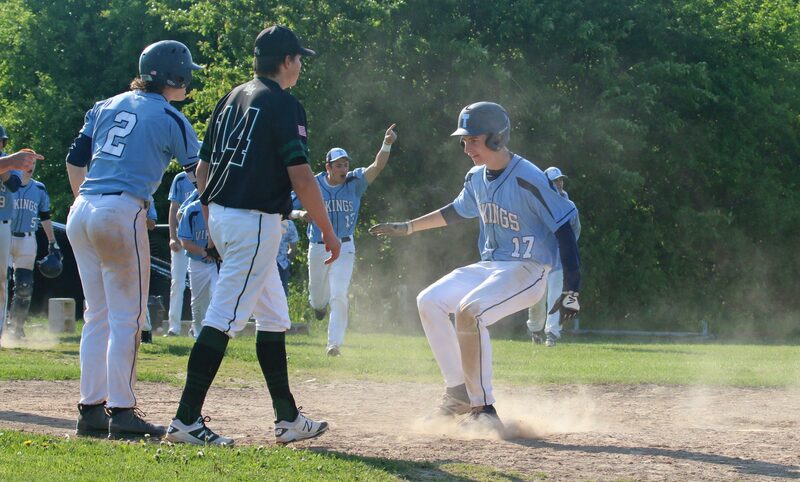 Another wild pitch brought Marc Wood home with the winning run. Plenty of hits. 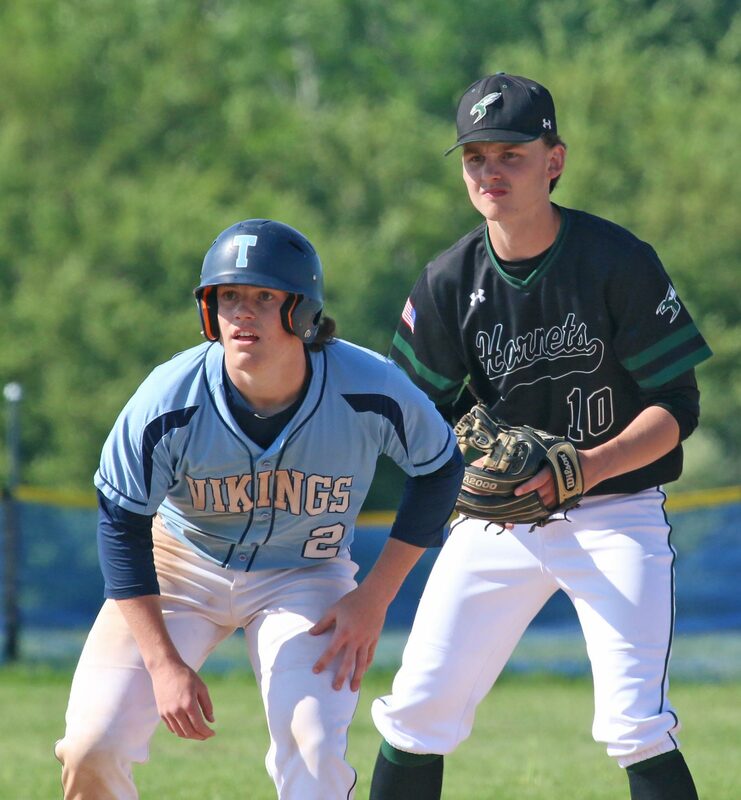 Triton had twelve including two doubles and a single from Tommy Lapham. ME collected ten hits including two each from Robbie Sarmanian, Cosmo Pallazola, and Will Janowicz. Ross Lojek had three RBI for the winners. 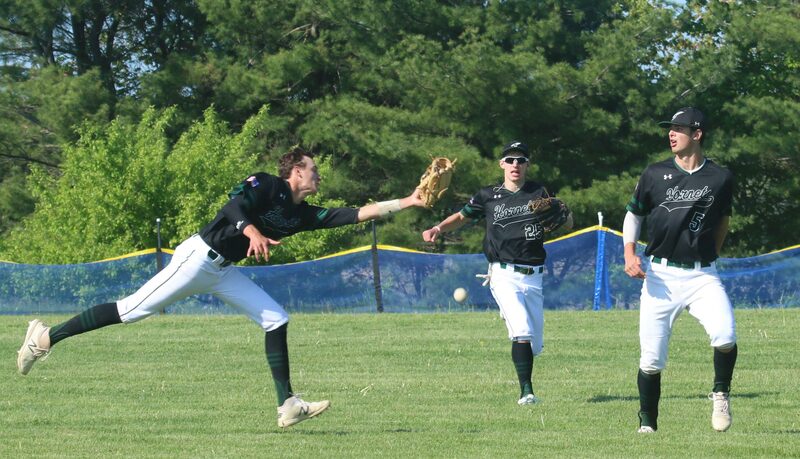 Kyle Odoy (1B), Dylan Shute (2B) and Cole Lojek (RF) had solid defensive plays in the first three innings. 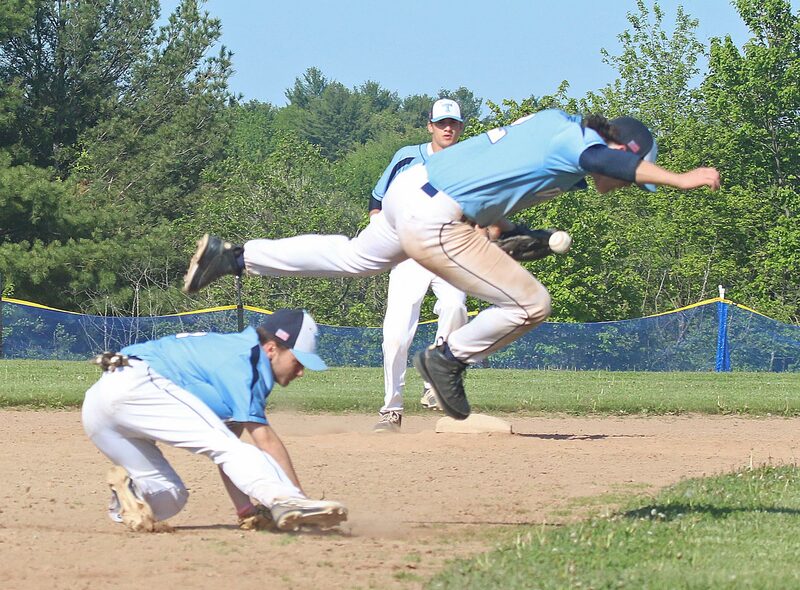 Shortstop Tommy Lapham showed good range to get to a ball in the 7th inning and a strong arm to toss out the runner. The Hornets have now lost four straight to Triton. The Hornets were 19-4 last season reaching the Division 4 North finals. “Mark Glickman came into a tight situation in relief and did a great job,” said Coach McCarthy. Sunny day with the wind definitely blowing toward left. 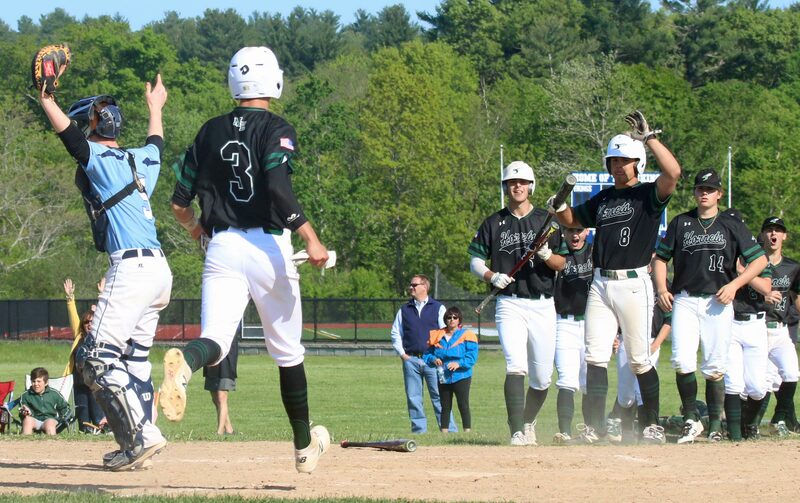 Three homers (Robbie Sarmanian, Bennett O’Leary, and Kyle Odoy) went that way.